“Special Discounts for Special People in our Special Town” offered by the following downtown businesses throughout the month of February! Look for the BIG RED HEART on the door for participating merchants in the Main Street area! BLUE RIDGE BEER HUB $1 off full pours in February. Pop-up Beer Tastings each week (follow us on social media for details). 21 East St.
DILLSBORO CHOCOLATE FACTORY in Waynesville 10% off with a local ID, excludes hand dipped strawberries. ELLIE’S FINE RESALE 25% discount off purchases during the month of February. FIREFLY TAPS AND GRILL Locals ask to spin the wheel to see what you get! Free food, prizes, discounts & more! We love our locals! HIGH COUNTRY STYLE 10% off February purchases 121 N. Main St.
J GABRIEL 50% off every Tuesday in February. KANDI’S CAKES and BAKE SHOP will sell a “Baker’s Dozen” for the price of a regular dozen 200 S Main St.
MOONLIGHT and GARBO 50% off every Tuesday in February. MOUNTAIN QUILTS Specials throughout the Quilt Shop on Main Street during the month of February. OLDE BRICK HOUSE Double Stamp Thursday – receive double stamps on your Preferred Client Card for your Thursday purchases. ROOTS SALON 20% off of shampoo blow dry and 25% off of any of our styling tools Free Hugs!!!! SMOKY MOUNTAIN DOG BAKERY offering FREE bags of mixed treats to locals. No ID required. THE KITCHEN SHOP 10% Tuesdays for locals! 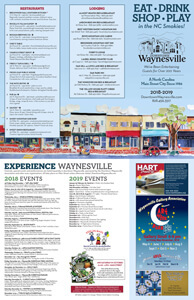 Just mention you LOVE living in Waynesville! 10% off applies to regular priced merchandise. WALL STREET BOOK STORE Drawing from each week’s shoppers for a variety of Bookstore Goodies, including trade credit and gift certificates, and a WSB t-shirt. WAYNESVILLE YOGA CENTER 10% off everything for locals! 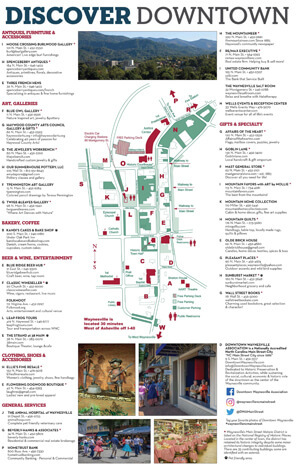 If you are ready to visit our enchanting town, be sure to print our complimentary visitors guide to take advantage of all we have to offer during your stay.